Isco 3700 Portable Full-Size Sampler - Gripp Inc. The full-featured 3700 Sampler collects sequential or composite samples based on time, flow rate, or storm conditions. Our patented LD90 Liquid Presence Detector and exclusive pump revolution counting system deliver accurate, repeatable sample volumes time after time. Automatic suction line rinsing to eliminate sample cross contamination. The LD90’s non-contacting design is not affected by conductivity, viscosity, temperature, or liquid composition. There are no internal tubing connections, so cleaning and tubing replacement are fast and easy. With thick, foamed-in-place insulation and twin-wall design, your samples are protected, even in hot or cold temperatures. 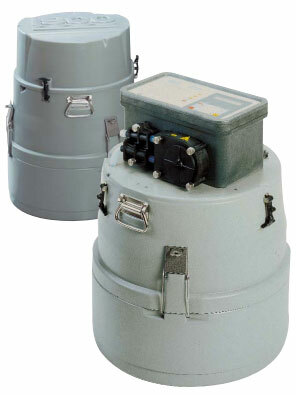 The 3700 provides maximum thermal preservation for a portable sampler. The 3700 Sampler controller components are protected in a tough environmentally sealed enclosure. The enclosure meets NEMA 4X and 6 (IP67) requirements for submersible, watertight, dust-tight, and corrosion resistant operation. For more information, download the Isco 3700 Portable Full-Size Sampler PDF.